Happy belated Labor day all! I hope you guys have been well. I took a small break from blogging to enjoy some time with my family! If you guys follow me on Instagram (@Hashtagglamour) – you probably know that I was in Philly for most of last week for my cousins wedding. It was a blast. I always feel exhausted but centered when I come back from a family reunion. Exhausted, because we usually stay up really late every night catching up and chatting about old times. Centered, because I really believe family is where the heart is! I was fortunate enough to grow up in a close knit family – where my cousins were around all the time. So it is always nice to see them – its like going back to my roots. Plus, it was the first time many of my aunts, uncles and cousins met Zara – so it made me really happy to see how much love everyone had for her. Enough of the mushy gushiness! Although I’m sad to see summer go – I’m super excited about the fall! Fall is one of my favorite seasons. This week I am going to start posting some of my favorite summer/fall transitionary looks! So stay tunned! 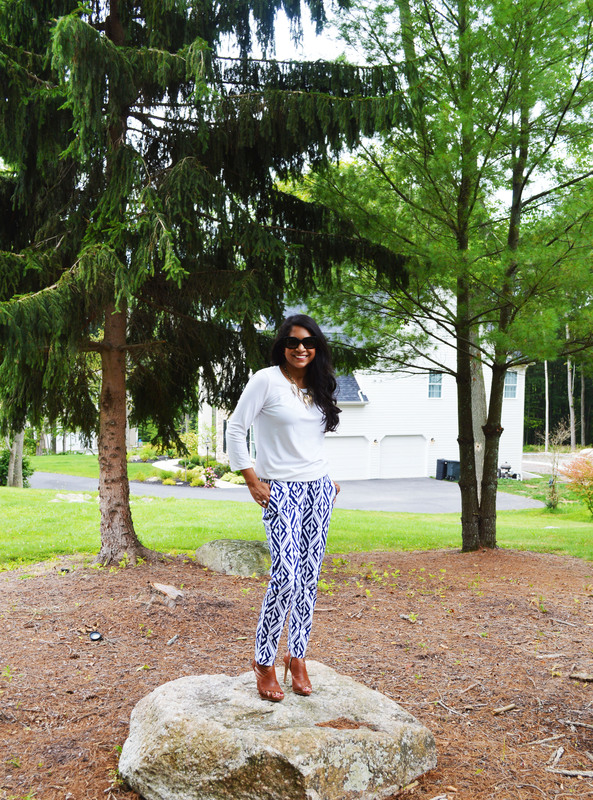 On the style: I bought these pants last year from Banana Republic on super sale! When I went to Philly and my cousin threw an amazing Carnival party (WITH HORSES!!) I busted them out! I matched the pants with a simple white shirt, a tribal looking statement piece from Anthropology, and tan booties. I was going for an overall chic tribal look! I hope you guys have a fantastic week!